High Definition displays with HDMI inputs use EDID (Extended Display Identification Data) to ensure that a connected Hi-Def source sends compatible audio and video signals. When displays are switched away or disconnected and then reconnected, the EDID data can be lost, resulting in an incorrect signal or complete loss of audio and/or video. The Gefen EXT-HD-EDIDPN HDMI EDID Detective Plus has been designed specifically to address this issue by recording the display EDID date and making it available to the Hi-Def source reliably and on a continuous basis. With DDC re-clocking technology, the reliability of HDCP handshaking is improved, ensuring that the Hi-Def source always receives the correct EDID. Using the Gefen Syner-G PC software or terminal emulation via USB, the installer can also manipulate/modify the EDID data to meet installation-specific requirements and resolve system-specific compatibility issues. The HDMI EDID Detective Plus has been designed for quick and easy programming and installation. The HDMI Detective Plus provides all the functionality of the DVI Detective N & DVI Detective Plus and adds HDCP pass-through with DDC Re-Clocking and the ability to use one of (6) pre-programmed EDID profiles and (6) user-programmable EDID banks for custom EDIDs. 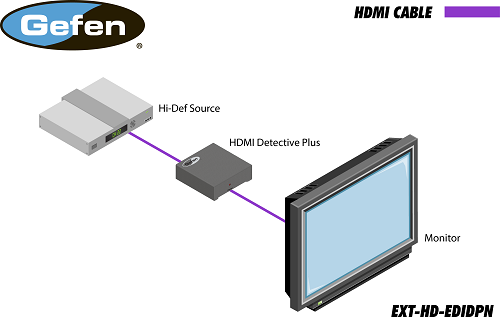 The Gefen HDMI Detective Plus memorizes the EDID profile of the connected source and the display. 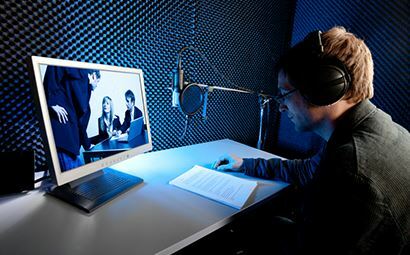 This Virtual EDID ensures perfect video resolution and frequency timing. Activating the write-protection switch on the outside of the unit will lock the settings from to prefent any accidental over-ride. 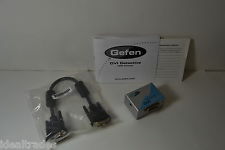 The Gefen HDMI Detective Plus fools the computer into thinking that a display is present, even when the port is inactive or the display is switched away to another computer. This prevents computer systems from deactivating inactive HDMI ports, and ensures consistant resolution and frequency regardless of operation. The Gefen EXT-HD-EDIDPN provides 3 flexible EDID banks for convenient switching & setting of EDID profiles for any application. Includes (1) Local EDID bank for plug-and-play EDID detection, (6) preset EDID banks for the most common settings, and (6) configurable EDID banks for custom EDID profiles. EDID profiles can also be saved and uploaded for convenient management. EXT-HD-EDIDPN supports High Definition HDMI (or DVI with adapter) resolutions up to 1080p Full HD, and 1920 x 1200 (WUXGA). 12-bit Deep Color, 3DTV pass-through, Lip-Sync pass-through, & CEC pass-through, and HDCP support ensure compatibility with majority of modern AV devices. Also carries High-Fidelity 7.1-channel surround-sound audio over HDMI ('HDMI-Embedded Audio') with support for Dolby TrueHD, Dolby Digital Plus, and DTS-HD Master Audio. The EXT-HD-EDIDPN supports selectable HDCP pass-through. With DDC re-clocking technology, the reliability of HDCP handshaking is improved, ensuring that the Hi-Def source always receives the correct EDID. With a 2.7"W x 1.3"H x 1.8"D footprint and only 0.18 lbs (4.87 oz) of mass, the Gefen EXT-HD-EDIDPN takes up less space than a pack of cards and weighs about ½ of an iPhone 6. Designed with a compact form-factor, flexible EDID switching, and with quick and easy setup, the Gefen HDMI Detective Plus is the perfect portable EDID emulator for any application. Configurable EDID using Gefen Syncher-G software. *HDMI Detective Plus is equipped with HDMI ports, but it is also compatible with DVI (no audio) by using HDMI (F) to DVI (M) / DVI (F) to HDMI (F) or HDMI (M) to DVI (F) / DVI (M) to HDMI (M) passive adapters (available separately). 1 DIP Switches Use this DIP switch bank to select a pre-programmed EDID. See EDID Programming for more information. 2 HDMI Out Connect the Hi-Def display to this port using an HDMI cable. 3 WR (Write-enable) switch Write-enable switch. 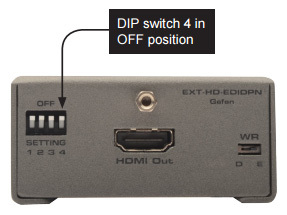 Flip this switch to the "E" position to allow the HDMI Detective Plus to be programmed with an EDID. Set this switch to the "D" position to disable programming and prevent an accidental erasure of the current EDID. 4 'Prog' Button Press this button to begin programming an EDID. See EDID Programming for more information. 5 HDMI In Connect the Hi-Def source to this port using the included HDMI cable. 6 USB Optionally connect the included USB Type A to MiniUSB Type B cable to this connector. This interface provides serial control & convenient firmware upgrades for the detective. 7 Power This LED provides an indicator for the HDMI Detective Plus system status. - This LED will glow bright green when the unit is powered, the HPD is High, or the EDID has been succesfully written. - This LED will flash green when the EDID is being read from sink orthe EDID bank. - This LED will glow red for bad EDID settings, or when the HPD is low. 8 5V DC Connect the included 5V DC power supply to this power receptacle. The EXT-HD-EDIDPN provides 3 flexible EDID banks for convenient switching & setting of EDID profiles for any application. 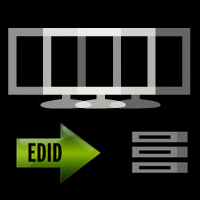 The EXT-HD-EDIDPN features (1) Local EDID bank for easy EDID detection of any monitor plugged in without any software. 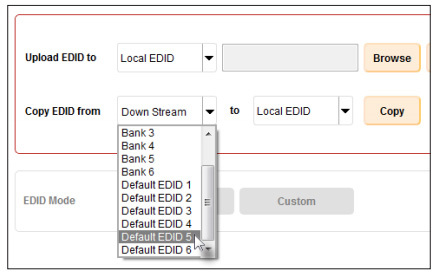 If a suitable EDID cannot be recorded, there are (6) default preset EDID banks for the most common settings, and (6) configurable EDID banks for custom EDID recording. EDID profiles can also be saved and uploaded for convenient management using the Gefen Syner-G Software Suite or serial RS-232 terminal commands. Before using the HDMI Detective Plus, the unit must be set with an EDID. When a source device uses the EDID stored in the HDMI Detective Plus, this is called local mode. Programming the local bank is very simple and only takes a few seconds! Simply connect the EXT-HD-EDID to the source, and the EDID data will be read by the source, providing all the necessary details of the type of signal that the display (or other sink device) can process. Begin by powering-on the display (or other sink device) containing the EDID to be recorded. Connect a HDMI cable from the sink device to the HDMI Out port on the HDMI Detective. Make sure all DIP switches are in the OFF position. 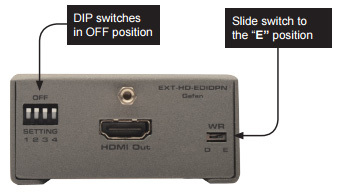 Move the WR (write) switch to the "E" position in order to allow the EDID to be written to the HDMI Detective. Connect the included 5V DC power supply to the HDMI Detective. The Power LED, on the other side of the unit, will glow solid green if the sink device contains a valid EDID. If the EDID is corrupt or invalid, then the Power LED will glow bright red. Press and release the Prog button. The Power LED will flash as the EDID is recorded. Once the EDID has been recorded, the Power LED will glow bright green. Move the WR switch to the "D" position to prevent accidental erasure of the EDID. The EDID programming process is complete! NOTE: When the HDMI Detective Plus is used in local mode, HPD (Hot-Plug Detect) is always high. The HDMI Detective Plus comes with (6) Default EDID profiles which can be copied to a bank or to the local input (HDMI In). Unlike the EDID data stored in EDID banks, these Default EDID profiles cannot be overwritten or deleted. See Default Supported EDID Profiles for a resolutions and frequencies supported. Default EDID profile manipulation can be handled through RS-232 commands or by using the Gefen Syner-G Software Suite. We will cover choosing the Default EDID profile using Gefen Syner-G method below - Please refer to the manual for recording EDID using RS-232 commands, setting up the Virtual COM Port, and all the available RS-232 commands. Download and install the Gefen Syner-G software. Refer to the Syner-G User Manual for installation instructions. Launch the Gefen Syner-G Software Suite. Click the Refresh List button. Select HDMI Detective Plus from the Select Product drop-down list, at the top of the screen. If the HDMI Detective Plus is not listed in the Select product drop-down list, click the Refresh list button and wait a few moments, then try again. Click the Manage EDID tab. Select the desired Default EDID profile from the Copy EDID from drop-down list. The Local EDID will automatically be selected. Default EDID profiles cannot be copied to a bank. For recording EDID using RS-232 commands, setting up the Virtual COM Port, and all the available RS-232 command, please refer to the Manual. The HDMI Detective Plus comes 6 pre-programmed EDID profiles. The details of each default EDID profile is described below. 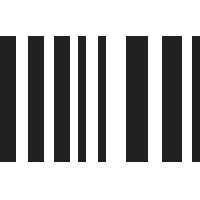 When an EDID is recorded, the EDID data is stored on the local input (HDMI In) port. However, the HDMI Detective Plus also allows EDID data to be stored directly to any of 6 EDID banks. Each EDID can then be recalled at any time. The data in an EDID bank is saved even when the power is disconnected. For Custom EDID Bank functionality, please refer to the EXT-HD-EDIDPN manual. In order for the HDMI Detective Plus to pass HDCP content (e.g. Blu-ray, etc. ), set DIP switch 4 to the OFF (up) position. To disable HDCP pass-through, set DIP switch 4 to the ON (down) position.